T-ara EunJung gives an official explanation about her snowman costume. Previously, EunJung’s snowman costume worn for T-ara’s Christmas special performances of their song ‘Bo Peep Bo Peep’ has been commented on by 2PM TaecYeon with, “Your costume today is some kind of punishment? Kekeke” and has been the topic amongst netizens. ‘Adult-dol’ Narsha (30) reveals her wish for 2010. During the episode of KBS ‘Invincible Youth’ aired on 1st January, the G7 members (So Nyeo Shi Dae Yuri, Sunny; KARA Goo Hara, Brown Eyed Girls Narsha, 4Minute HyunA, T-ara HyoMin, Secret Han SeonHwa) were seen wearing hanboks and sending their new year greetings to the TV viewers. MBLAQ and T-ara members pair up to go on one-day dates to the amusement park! 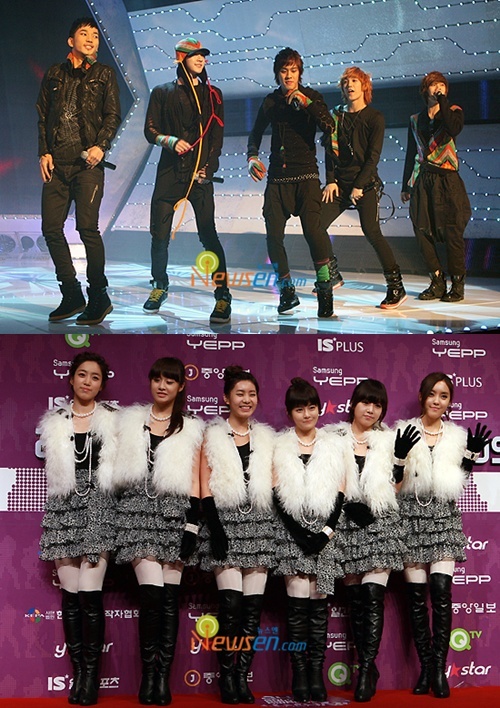 MBLAQ and T-ara members will go on a one-day date. A member from each team will pair up for MBC Every1 ‘Idol Season 5′ and go on a one-day date to the amusement park together. Because of the filming, the amusement park was crowded with fans following the filming “couples” around. The “couples” held hands and visited the haunted house together, and stuck to each other like real couples showing their intimate features. Go under the cut to find out the “couples” from the 2 groups. 2AM Jo Kwon and Brown Eyed Girls GaIn’s debut collaboration ‘We Fell In Love’ has been taking music charts by storm. The song has climbed up to the #1 spot on Monkey 3 site for the 4th week of December (21st ~ 27th December) in the same week of its release. The 2 who are currently playing make-believe couple for MBC We Got Married and the lyrics to the song talks about the real story of the 2 in a soft melody. #2 goes to Gummy’s ‘Because Of You’ which is also the main theme for SBS drama ‘Will it snow this Christmas?’. Go under the cut for the rest of the chart results.